In Washington state, the race and diversity of undergraduates studying to become teachers largely reflects the demographics of the colleges and universities that house them. At colleges and universities across the U.S., students training to become teachers are disproportionately whiter than the rest of the undergraduates on campus, new research has found. But that’s not the case in Washington state, where teachers in training look more like the increasingly diverse students they serve. Why does this matter? For students of color, having a teacher who looks like them makes a big difference in their success in school. Black male students who qualify for subsidized meals, a common barometer for poverty, are 39 percent less likely to drop out of high school if they have even one black teacher in grades 3-5, research has shown. But are colleges of education helping diversify the next generation of teachers? That’s the question researchers at the Urban Institute, a Washington, D.C.-based moderate-to-liberal-leaning think tank asked of all states. The federal government regularly tracks the demographics of students attending four-year colleges and universities. Using that data, the Urban Institute compared the racial breakdown of each college with the relative diversity of their teaching programs, and published their findings earlier this week. Here’s what they found: Across the country, a majority of teacher-preparation programs enroll a disproportionately large share of white students and a disproportionately small share of black students. 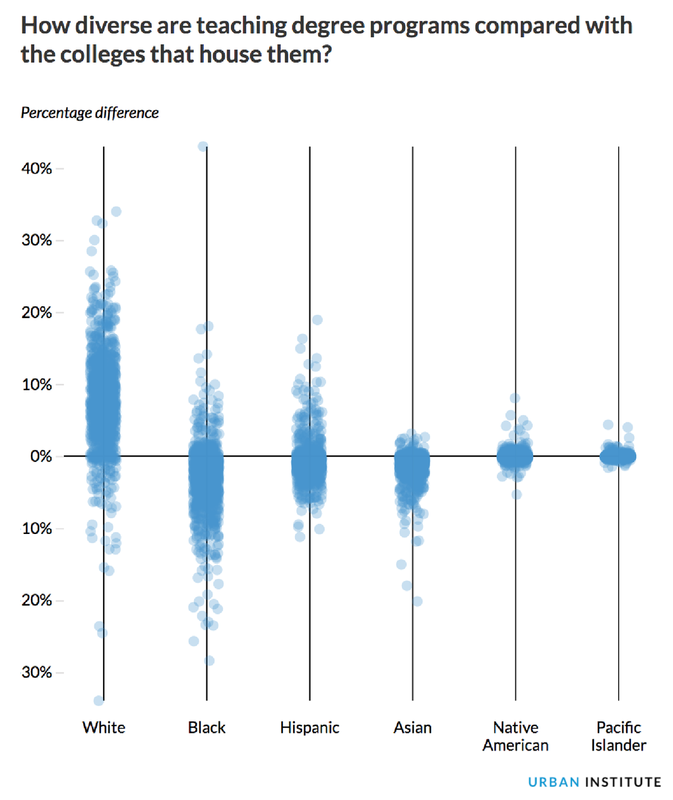 “This means that even when students of color make it through the first stage in the teacher pipeline — graduating high school and enrolling in college — at most universities they are less likely than their white counterparts to make it to the next stage: enrolling in a teaching-degree program,” researchers Constance Lindsay and Victoria Lee wrote on the Urban Institute’s website. Central Washington University, for example, typically graduates the largest number of new teachers coming out of the state’s colleges of education each year. At CWU, 10 percent of students studying education identify as Hispanic, compared with 11 percent of all students at the university. Asian, black, Native American and Pacific Islander students are similarly represented in teacher-preparation programs and the larger student body at CWU. The same is true at Seattle Pacific University, a private liberal arts school. Dan Bishop oversees SPU’s undergraduate teacher education programs, and he said the school has intentionally tried to recruit more students of color to consider teaching. “Sometimes it’s a matter of helping them understand who they are and what they want to accomplish … and how that fits in with teaching,” Bishop said. Last school year, SPU’s college of education started automatically granting admission to applicants who indicated an interest in teaching and met academic standards. The school sent about 100 letters of early admission, Bishop said, but added that it’s still too early to tell if that push improved the program’s diversity. Still, the college of education there has mirrored a growing share of students of color attending SPU: Between 2006 and last year, the share of students of color at SPU has grown from 15 percent to 40 percent. For undergraduates studying to become a teacher, the share of students of color increased from 4 percent in 2006 to 31 percent last year. The University of Washington does not offer a bachelor’s degree program in teaching and was therefore not included in the Urban Institute’s analysis. At the national level, the Urban Institute did find one area of exception to the general trend of disproportionately white enrollment: Historically black colleges and universities, and other institutions that serve larger shares of undergraduates of color.